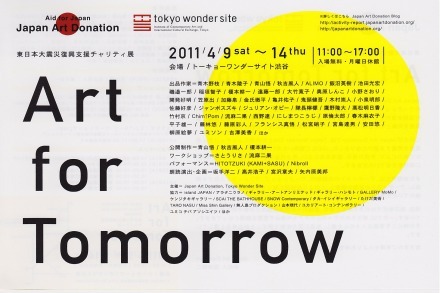 復興支援チャリティ展 Art For Tomorrow Charity Exhibition | たけだ美術 Takeda Art Co.
2011.4.9 Sat. - 4.14 Thur. Takeda Art Co. is pleased to participate in a charity exhibition ‘Art for Tomorrow’, which supports Tohoku/Kanto Earthquake victims. We are convinced that Art can soothe the soul, though an art industry has not been able to give enough assistance so far. To give people hope for tomorrow, we will widely and constantly support them as specialists in art business. For our Japan itself, and for the children undertaking the future of Japan, this ‘Art for Tomorrow’ is the point of our supporting. We are looking forward to your visit and cooperation.